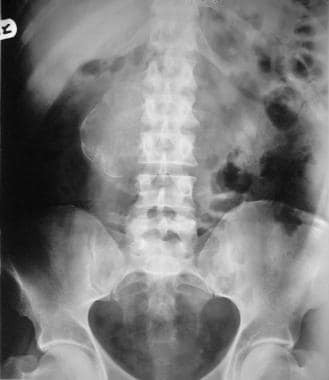 Plain abdominal radiograph of a patient with biopsy-proven retroperitoneal fibrosis shows a calcified mass in the retroperitoneum (to the right of the mid lumbar spine). RPF must be differentiated from other conditions that can cause ureteric obstruction and renal failure, such as retroperitoneal abscess, infections, inflammation, pelvic surgery, and radiation therapy. 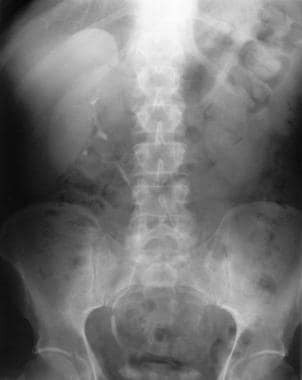 Unusual causes that can cause ureteric obstruction include barium granuloma after colon perforation, use of sclerosing agents for treatment of inguinal hernia and hemorrhoids, and methyl methacrylate cement used for joint replacement. Imaging appearances similar to those of RPF can be demonstrated by abdominal aortic aneurysm; tumors inducing desmoplastic response, such as lymphomas, sarcomas, and pancreatic carcinomas; and metastatic malignancies from the breast, lung, stomach, colon, kidney, bladder, prostate, carcinoid and cervix. Other conditions that may simulate RPF include periaortic hematoma and amyloidosis. Aortography, venography, and lymphangiography help in assessing the level and extent of occlusion; however, findings from these examinations can be normal in advanced disease. Ultrasonography can be used as a noninvasive technique. Sonograms may or may not help in identifying the retroperitoneal mass, but they can readily demonstrate the degree of obstruction to the ureters and kidneys. Attempts have been made to differentiate benign RPF from malignant RPF by using color Doppler imaging. Findings on plain radiography and contrast-enhanced studies are nonspecific, demonstrating the late effects of fibrosis. Excretory urography helps in establishing a diagnosis in the early stage of the disease. Characteristically, medial deviation of the ureter is present, usually at the middle third, beginning at the level of the third or fourth lumbar vertebra. The medial deviation of the ureter is not a constant finding in patients with RPF, and approximately 20% of patients with normal urographic findings have medial deviation of ureters without demonstrable evidence of pathologic change in the urinary tract. Most retroperitoneal neoplasms displace the ureters in a lateral direction, but medial deviation can occur. Other causes for medial displacement of the ureters include aneurysm, metastatic tumors, and bladder diverticulum. 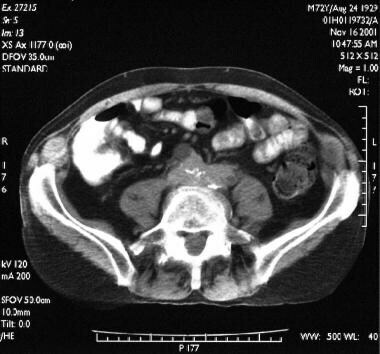 Medial displacement may be seen after abdominoperineal resection and removal of pelvic malignancy. Retrograde pyelography is an invasive technique with no additional value compared with excretory urography. On sonograms, RPF may appear as a relatively echo-free mass centered on the sacral promontory. Imaging the retroperitoneum may not be possible, particularly in obese patients or in those with excessive bowel gas. With CT and MRI, the fibrosis can be shown in more detail. The symmetrical distribution and geometric shape are highly suggestive of RPF. CT scans may not be helpful in differentiating benign RPF from malignant RPF. MRI may help in differentiating the 2 conditions, but the diagnosis cannot be certain by using MRI. On chest radiographs, signs of noncardiogenic pulmonary edema may be seen secondary to fluid overload. Pulmonary fibrosis can occur if associated with SLE and ankylosing spondylitis. Mediastinal widening may occur due to a soft-tissue mass associated with mediastinal fibrosis. Excretory 5-minute urographic image demonstrates medial deviation of the right ureter at the L3-L4 vertebral level, which is suggestive of retroperitoneal fibrosis. Note the delayed excretion of the hydronephrotic left kidney. Excretory 15-minute urographic image shows progression in the severity of hydronephrosis. Smooth tapering of the medially deviated ureters is noted. Excretory urogram in a 54-year-old man shows characteristic medial deviation of the ureter at the L4-L5 vertebral level. Note the lack of contrast material excretion on the left. Small ureteral catheters can be passed easily beyond the obstruction, despite the appearance of complete occlusion on excretory urograms, because of restricted peristalsis rather than intraluminal constriction. 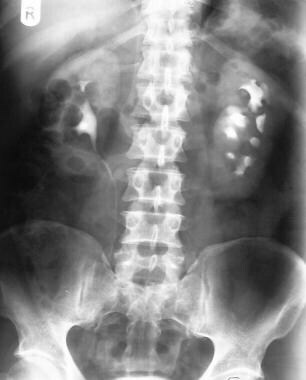 Plain radiographic findings are nonspecific and occur in a variety of other conditions that are more common than RPF. Moreover, the findings are related to late effects or complications of the disease process rather than to the disease itself. A diagnosis of RPF often is suggested on the basis of excretory urographic findings. Although excretory urography may be useful in showing the degree and level of obstruction in the ureters, it may not be particularly helpful in identifying the cause. Moreover, ureteric involvement and obstruction may not be seen in the early stage of the disease. Retrograde studies are used to demonstrate the pelvocalyceal system and ureter when they are inadequate because of poor renal function and to assess the extent of the disease process. Medial deviation of the ureter is not a constant finding in RPF, and approximately 20% of patients without RPF can have medial deviation. A minority of retroperitoneal neoplasms can also cause medial deviation of the ureter. Other conditions causing medial deviation of the ureters include aneurysm, metastatic tumor, and bladder diverticulum. Medial deviation can occur after abdominoperineal and pelvic malignancy resection. Findings from one study suggest no correlation between the degree of obstruction and clinical renal disease. On retrograde studies, the characteristic features of RPF are not a constant finding. 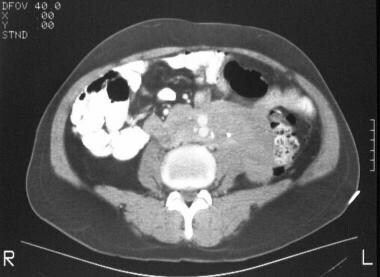 CT scan in a 62-year-old man shows a soft-tissue attenuating mass encircling the abdominal aorta. Note the extension of the soft-tissue mass around the left kidney. A right-sided nephrostomy and a left ureteric stent are seen. CT scan in a 62-year-old man shows a soft-tissue attenuating mass encircling the common iliac arteries. 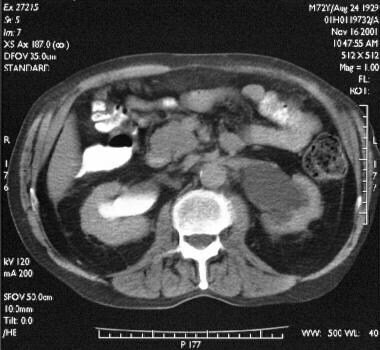 Nonenhanced transaxial CT scan of the abdomen in a 55-year-old man shows a well-defined, soft-tissue attenuating mass around the atheromatous abdominal aorta of normal caliber. Contrast-enhanced transaxial CT scan in a 55-year-old man shows mild enhancement of a soft-tissue mass encircling the lower abdominal aorta. Transaxial enhanced abdominal CT scan in a 72-year-old man shows bilateral hydronephrosis that is more pronounced on the left than on the right. Transaxial contrast-enhanced CT scan through the lower abdomen in a 72-year-old man (same patient as in the previous image) shows a soft-tissue mass encasing the iliac vessel and ureters at the L5 vertebral level. On CT scans, RPF may appear as a rind of soft tissue around the aorta and inferior vena cava extending between the renal hilum and sacral promontory. Laterally, RPF spreads to involve the ureters, causing varying degrees of obstruction. The fat plane between the mass and the psoas muscle may be obliterated. The mass tends not to displace the aorta anteriorly. The attenuation value of the mass is similar to that of muscle and shows variable degrees of enhancement depending on the stage of the disease. Certain CT features can help in differentiating benign masses from malignant masses. 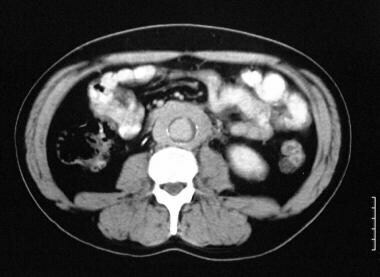 The mass in RPF may be bulky but not as massive as neoplastic lesions; however, some exceptions exist. The presence of enlarged mesenteric nodes and displacement of the aorta from the spine by the periaortic mass favors malignancy, although some displacement can occur in RPF. Unlike RPF, most retroperitoneal neoplasms displace the ureters laterally. RPF does not produce local bone destruction. The CT value and contrast enhancement have no role in distinguishing benign masses from malignant masses. 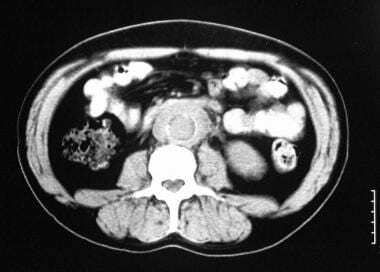 Similar CT features may be seen in metastatic malignancy, lymphoma, periaortic hematoma, and amyloidosis. The signal intensity of RPF is distinct from that of the adjacent fat and psoas muscle, thereby enabling adequate visualization of the lesion. MRI may help in assessing the response to treatment. After steroid therapy in the early stage of the disease, tissue edema is reduced and appears hypointense on T2-weighted sequences. Since the MR imaging features of most retroperitoneal soft-tissue masses are nonspecific, prediction of a specific histologic diagnosis remains a radiologic challenge. Nevertheless, there are some specific MRI appearances that are useful. Dynamic enhancement patterns can reflect the vascularity of masses, differentiating benign from malignant soft-tissue masses. Most malignancies demonstrate high signal intensity on T2-weighted images; therefore, differentiating the early stage of RPF from malignancy may not be possible. Although the inhomogeneity of signal on T2-weighted sequences suggests malignancy, the diagnosis cannot be certain on the basis of MRI appearances alone. On ultrasonograms, RPF may appear as a well-defined, smooth-marginated, hypoechoic, retroperitoneal soft-tissue mass encasing the aorta and inferior vena cava. Distal extension beyond the sacral promontory and the absence of lobulation suggest a benign etiology. Ultrasonography may demonstrate dilatation of the pelvocalyceal system and the ureters. Sonograms may show features of coexisting primary biliary cirrhosis, bile duct dilatation due to common bile duct stricture, portal hypertension due to portal vein compression, focal or diffuse pancreatic mass due to sclerosing pancreatitis, and dilated bowel loops due to obstruction. Some have attempted to use Doppler ultrasonography to differentiate benign RPF from malignant RPF. However, findings suggest that color Doppler ultrasonography has no role in differentiating benign masses from malignant retroperitoneal masses. Ultrasonography is a noninvasive technique that can be used to diagnose RPF and to perform follow-up studies. The detection of RPF with ultrasonography depends on the size of the periaortic soft tissue. Detecting RPF in the early stage may not be possible, and assessing the retroperitoneum may be difficult, particularly in obese patients or in those with a large amount of bowel gas. Ultrasonography is not a sensitive examination, as compared with CT and MRI. Color Doppler imaging is not helpful in differentiating benign masses from malignant masses because they have no distinguishing features. Ultrasonography is not the imaging modality used to assess RPF. Assessing the para-aortic region may be difficult, particularly in obese individuals, because of excessive retroperitoneal fat. Although features such as caudal extension beyond the sacral promontory and the absence of lobulation suggest a benign cause, malignancy cannot be excluded with confidence. Color Doppler imaging has no role in differentiating benign masses from malignant retroperitoneal masses. 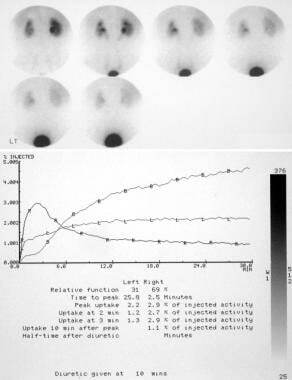 Analog (top) and digital (bottom) images of a radionuclide renogram show bilateral hydronephrosis with reduced function in the left kidney. Angiography and venography help in assessing the level and degree of obstruction. Abdominal aortic aneurysm can be demonstrated on angiograms. Lymphangiographic findings in RPF include a delay in the passage of contrast material through the aortic and para-aortic lymphatics. Lymphatic flow may be obstructed at the L3-L4 vertebral level, resulting in nonvisualization of the lymphatics above the fourth lumbar vertebra, filling of collateral lymphatic channels, and small, irregular filling defects in the mesenteric and para-aortic lymph nodes. The absence of lymph node metastasis helps in excluding malignancy. Lymphangiography can be a complementary study to excretory urography. The retroperitoneal lymphatics are delicate structures; therefore, obstruction of the lymphatics occurs before compression of the ureters or major vessels. Angiography and venography are not helpful in the diagnosis of RPF. Angiography often leads to underestimation of the size of an aortic aneurysm, due to the presence of a mural thrombus. Lymphangiographic findings can be negative in patients with severe RPF. Albarran J. Retention rénale par periurétérité. Libération externe de l’uretère. 9. Association française d'urologie; 1905. 511. Ormond JK. 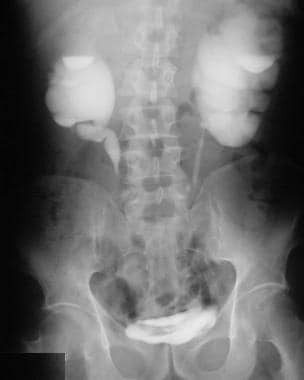 Bilateral ureteral obstruction due to envelopment and compression by an inflammatory retroperitoneal process. Journal of Urology, Baltimore. 1948. 59:1072-1079. Mitchinson MJ. Insoluble lipids in human atherosclerotic plaques. Atherosclerosis. 1982 Oct. 45(1):11-5. [Medline]. Parums DV, Brown DL, Mitchinson MJ. Serum antibodies to oxidized low-density lipoprotein and ceroid in chronic periaortitis. Arch Pathol Lab Med. 1990 Apr. 114(4):383-7. [Medline]. Baker LR, Mallinson WJ, Gregory MC, et al. Idiopathic retroperitoneal fibrosis. A retrospective analysis of 60 cases. Br J Urol. 1987 Dec. 60(6):497-503. [Medline]. Barbalias GA, Liatsikos EN. Idiopathic retroperitoneal fibrosis revisited. Int Urol Nephrol. 1999. 31(4):423-9. [Medline]. Breems DA, Haye H, van der Meulen J. The role of advanced atherosclerosis in idiopathic retroperitoneal fibrosis. Analysis of nine cases. Neth J Med. 2000 Feb. 56(2):38-44. [Medline]. Bullock N. Idiopathic retroperitoneal fibrosis. BMJ. 1988 Jul 23. 297(6643):240-1. [Medline]. Kottra JJ, Dunnick NR. Retroperitoneal fibrosis. Radiol Clin North Am. 1996 Nov. 34(6):1259-75. [Medline]. Lepor H, Walsh PC. Idiopathic retroperitoneal fibrosis. J Urol. 1979 Jul. 122(1):1-6. [Medline]. Utz DC, Henry JD. Retroperitoneal fibrosis. Med Clin North Am. 1966 Jul. 50(4):1091-9. [Medline]. von Fritschen U, Malzfeld E, Clasen A, Kortmann H. Inflammatory abdominal aortic aneurysm: A postoperative course of retroperitoneal fibrosis. J Vasc Surg. 1999 Dec. 30(6):1090-8. [Medline]. Vaglio A, Palmisano A, Corradi D, Salvarani C, Buzio C. Retroperitoneal fibrosis: evolving concepts. Rheum Dis Clin North Am. 2007 Nov. 33(4):803-17. [Medline]. Disel U, Alpay NR, Paydas S. Retroperitoneal fibrosis secondary to different etiologies (hemilaminectomy and hypothyroidism): reports of two cases. Ren Fail. 2007. 29(5):639-46. [Medline]. Mani R, Niraj A, Sreedhar R. Retroperitoneal fibrosis as a long-term complication of radiation treatment for prostate cancer. South Med J. 2007 May. 100(5):545-7. [Medline]. Moussavian B, Horrow MM. Retroperitoneal fibrosis. Ultrasound Q. 2009 Jun. 25(2):89-91. [Medline]. Clark CP, Vanderpool D, Preskitt JT. The response of retroperitoneal fibrosis to tamoxifen. Surgery. 1991 Apr. 109(4):502-6. [Medline]. Cogan E, Fastrez R. Azathioprine. An alternative treatment for recurrent idiopathic retroperitoneal fibrosis. Arch Intern Med. 1985 Apr. 145(4):753-5. [Medline]. Hughes D, Buckley PJ. Idiopathic retroperitoneal fibrosis is a macrophage-rich process. Implications for its pathogenesis and treatment. Am J Surg Pathol. 1993 May. 17(5):482-90. [Medline]. McDougal WS, MacDonell RC Jr. Treatment of idiopathic retroperitoneal fibrosis by immunosuppression. J Urol. 1991 Jan. 145(1):112-4. [Medline]. Spillane RM, Whitman GJ. Treatment of retroperitoneal fibrosis with tamoxifen. AJR Am J Roentgenol. 1995 Feb. 164(2):515-6. [Medline]. Wagenknecht LV, Hardy JC. Value of various treatments for retroperitoneal fibrosis. Eur Urol. 1981. 7(4):193-200. [Medline]. Kuwatani M, Kawakami H, Makiyama H, Onodera M, Matsumoto K, Karasawa G. Autoimmune pancreatitis with retroperitoneal fibrosis which responded to steroid therapy but was complicated with refractory renal dysfunction. Intern Med. 2007. 46(18):1557-64. [Medline]. Dixon AK, Mitchinson MJ, Sherwood T. Computed tomographic observations in periaortitis: a hypothesis. Clin Radiol. 1984 Jan. 35(1):39-42. [Medline]. Ayuso JR, Garcia-Criado A, Caralt TM, et al. Atypical retroperitoneal fibrosis: MRI findings. Eur Radiol. 1999. 9(5):937-9. [Medline]. Ozgen A, Cila A. Renal involvement in multifocal fibrosclerosis: CT and MRI. J Comput Assist Tomogr. 1999 Nov-Dec. 23(6):937-8. [Medline]. Elsayes KM, Staveteig PT, Narra VR, Chen ZM, Moustafa YL, Brown J. Retroperitoneal masses: magnetic resonance imaging findings with pathologic correlation. Curr Probl Diagn Radiol. 2007 May-Jun. 36(3):97-106. [Medline]. Kamper L, Brandt AS, Ekamp H, Abanador-Kamper N, Piroth W, Roth S, et al. Diffusion-weighted MRI findings of treated and untreated retroperitoneal fibrosis. Diagn Interv Radiol. 2014 Nov. 20 (6):459-63. [Medline]. Bakir B, Yilmaz F, Turkay R, Ozel S, Bilgiç B, Velioglu A, et al. Role of diffusion-weighted MR imaging in the differentiation of benign retroperitoneal fibrosis from malignant neoplasm: preliminary study. Radiology. 2014 Aug. 272 (2):438-45. [Medline]. Niccoli Asabella A, Nicoletti A, Altini C, Notaristefano A, Lastilla G, Rubini G. 18F-FDG Positron Emission Tomography/Computed Tomography in the Diagnosis and Post-Therapeutic Treatment in a Patient with an Early Stage of Retroperitoneal Fibrosis. Mol Imaging Radionucl Ther. 2013 Aug. 22 (2):60-2. [Medline]. Caiafa RO, Vinuesa AS, Izquierdo RS, Brufau BP, Ayuso Colella JR, Molina CN. Retroperitoneal fibrosis: role of imaging in diagnosis and follow-up. Radiographics. 2013 Mar-Apr. 33 (2):535-52. [Medline]. Poitras JM, Dennis GJ. Clinical images: Diagnosis and treatment of retroperitoneal fibrosis (Ormond''s disease). Arthritis Rheum. 2000 Apr. 43(4):943. [Medline]. Wiesner W, Stoffel F, Bongartz G. Imaging findings in idiopathic pelvic fibrosis. Eur Radiol. 2001. 11(4):665-9. [Medline]. Geoghegan T, Byrne AT, Benfayed W, McAuley G, Torreggiani WC. Imaging and intervention of retroperitoneal fibrosis. Australas Radiol. 2007 Feb. 51(1):26-34. [Medline]. Hillebrand M, Gerstenberg E, Kuntz RM, et al. [67Ga scintigraphy in retroperitoneal fibrosis (RPF): indications, application and clinical relevance--report of five patients]. Nuklearmedizin. 1996 Feb. 35(1):25-30. [Medline]. Strauss LG. Fluorine-18 deoxyglucose and false-positive results: a major problem in the diagnostics of oncological patients. Eur J Nucl Med. 1996 Oct. 23(10):1409-15. [Medline]. Jansen I, Hendriksz TR, Han SH, Huiskes AW, van Bommel EF. (18)F-fluorodeoxyglucose position emission tomography (FDG-PET) for monitoring disease activity and treatment response in idiopathic retroperitoneal fibrosis. Eur J Intern Med. 2010 Jun. 21(3):216-21. [Medline]. Witten DM. Retroperitoneal Fibrosis Clinical Urography. Vol 3. Philadelphia:. WB Saunders Co. 1990:2469. Brandt AS, Kamper L, Kukuk S, Piroth W, Haage P, Roth S. An aid to decision-making in therapy of retroperitoneal fibrosis: dynamic enhancement analysis of gadolinium MRI. J Clin Med Res. 2013 Feb. 5(1):49-56. [Medline]. [Full Text]. Piccoli GB, Consiglio V, Arena V, Pelosi E, Anastasios D, Ragni F, et al. Positron emission tomography as a tool for the 'tailored' management of retroperitoneal fibrosis: a nephro-urological experience. Nephrol Dial Transplant. 2010 Feb 15. [Medline]. Treglia G, Mattoli MV, Bertagna F. Fluorine-18-fluorodeoxyglucose positron emission tomography in assessing retroperitoneal fibrosis: a literature review. Int J Mol Imaging. 2012. 2012:484052. [Medline]. [Full Text]. Nephrostogram obtained after percutaneous nephrostomy shows smooth tapering of the ureter at the L4-L5 vertebral level. Bilateral ureteric double-J stent in a patient with ureteric obstruction. Note the characteristic medial course of the right ureteric stent at the L4-L5 vertebral level. Aortic and common iliac arterial graft in a patient with severe arterial insufficiency secondary to retroperitoneal fibrosis. 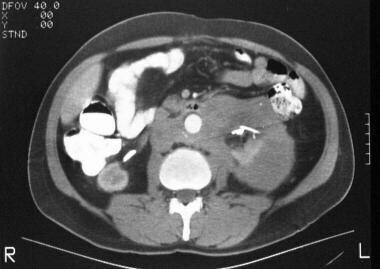 Note a nephrostomy catheter in the right renal collecting system and the fragmented left ureteric stent.